Another grotty day today - cold wind, dark all day, spitting rain - but apparently the really bad weather is on its way for tomorrow! I was a bit desperate for shots and decided to head along the river by the boathouses and barges. Unsurprisingly there wasn't much going on and I am still desperate for shots but I quite like the reflection of the tree next to the tree sculpture on Midsummer House Restaurant. Midsummer House has two Michelin Stars, is currently run by Daniel Clifford and costs a lot!! I've only been once - it's the sort of place where you get a glass of foam as a palette cleanser (or something!) between courses and you try and nip to the loo without being noticed and find that your napkin has been tidied for you. Very nice though especially if somebody else is paying! Huge thanks for the great response to yesterday's berries - you are lovely people! Well spotterd, its quite hard to find a shot at the moment. Roll on spring flowers! lol wonderful description of the restaurant!!! I'm not a big eater but when watching Masterchef I kept commenting about the size of the portions and all that dribble round the plate!! This is a very cleverly composed picture Judith with the tree and the reflection, very thoughtful. Thanks for the weather warning! cool wall, great spot with the tree refection.. yeah one fer @fueast 's ELT tag. Another intersting and imaginative composition. What also captures my eye, and makes for a bit of 'instability' in the photo, is the way that the window appears to be falling in to the right hand corner. And then when I look closely at the wall I see that the brickwork has seen better days!! Nice shot, Judith ... and a lovely commentary! Nice shot. Great reflection in the window! Unusual way of photographing trees! Nice to see some of the restaurant - I had heard of it and googled it (never went there though) a few years ago when a local young chef worked there for a while. He has just opened his own place in Beaumaris. @mejbronant The food was delicious as I remember - some day I'll go again when I've got a good enough reason! @rich57 Obviously not memorable loos - too distracted by the thought of my napkin being folded again!!! Sounds the sort of restaurant off Mater Chef & I would love to try somewhere like that but not with Harry who is a meat & two veg man ...it would be completely wasted on him ! Jane has said it perfectly you have a great eye even in terrible weather when every one is posting rubbish you always pull one out of the hat !! very stylish picture ! That shadow of the tree falling on the window is so effective, very well observed. Your description just cracked me up - especially the loo part! You are so creative no matter the circumstance or weather! This is a vintage photo - nice processing! The window is what keeps drawing me back. This is a great composition! Love the tree, the window and reflection! love the way the window shows both the blinds and teh reflection. You made a MODern Art picture here. Love the texture in the wall, and the slight crooked window sill. Great shot. Sounds like a restaurant I would shy away from, too arty for me! I like the tree reflections in the window! grotty day here too Judith, I'm struggling for pics now I'm back at work ! If in doubt take a pic of a wall !!!! Judith this is so very interesting! I keep getting lost in it! that reflected tree is fabulous! Fabulous shot! I love a good window photo and this one is first class! Sounds like Midsummer House is first rate as well ~ would love to dine there! Great shot Judith, love the tones and reflections. This is wonderful, Judith. You certainly created a gem on a not so nice sort of day. 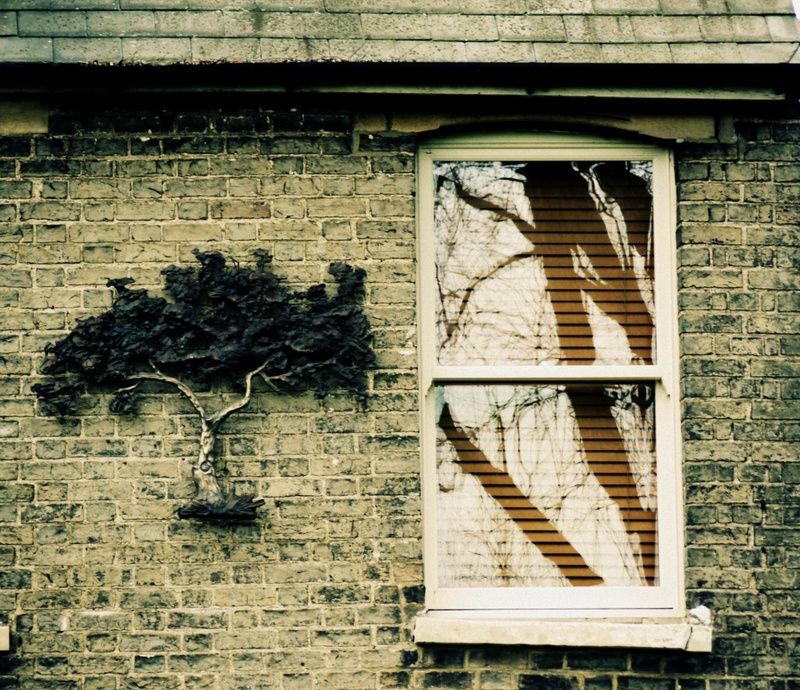 Love the 2 trees and the horizontal lines - I'm guessing blinds - in the window against the texture of the bricks. A fav. My kind of shot... love it... creative, nice textures, abstract yet not perfect composition. I can only say I must fav this one. Wonderful shot, I haven't ventured outside much the past couple days since it is cold, wet and windy here. This is a great shot. Hoping the bad weather eases a bit soon. this is just lovely! I love love love shots of old buildings.... this is particularly interesting, and I love the reflection! I like that the window blinds force you to pay attention to what is on the outside. Fav. Nice! Love the virtual monochromatic scheme.